Blue Hills Studios in San Jose: Open House Tomrrow! Open House tomorrow 10/06/12, 11 am to 3 pm! 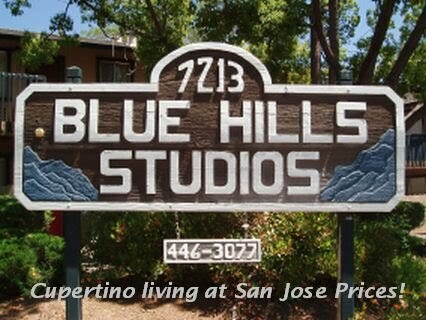 Stop by and see for yourself that the Blue Hills Studios is the best value in the Cupertino area!! I'm down to my last two vacancies of the summer. I expect they will both rent at the open house tomorrow, so if you were hoping to get one, get here early with your application complete and a cashiers check/money order for your holding deposit! Best value in the Cupertino area!! These upgraded studio apartments are in a great location with views of the Cupertino Hills and are conveniently located right off the 85 freeway at De Anza, with easy access to the 280 freeway and the Lawrence Expressway, close to Cupertino schools, medical center, and Calabazas park. Our apartments feature Cupertino living at San Jose prices!! These large studio apartments feature separate bathroom and kitchen area, with a patio/balcony, and an amazing walk in closet. This beautifully landscaped property features a heated swimming pool, on site laundry, and garages (garages require a separate fee). You don't want to miss your chance to get one of our last remaining studios while they're still available. If you can't make our open house, please contact to schedule an appointment to view your new home and to submit your application. PropMgrJay (at) gmail (dot) com (408) 446-3077.